As I blogged about before, my current work laptop is a Lenovo W510 which is a really great machine once you get it working, but the setup can be a little bit tricky. Because I work on Sametime and most of my collagues are remote from me, I spend most of my days in Sametime Audio/Video meetings. When I got the laptop initially one of the factors that impressed me was the quality of the built in microphone. In fact the quality of the built in microphone was so high that I no longer had to use a dedicated headset. Unfortunately, after a few months people began to complain that they could not hear me clearly. Initially I was able to solve this by simply turning up the microphone gain with the "sound preferences" application, but eventually people complained that they could no longer hear me even with the gain turned up to the maximum. I was so desperate to find a solution that I even tried using Windows on my laptop, but this didn't seem to behave any differently so I was convinced that the problem was a hardware one. I raised a ticket with our local hardware support team to see if they could repair it. They reported that when they tested it the volume coming from the microphone was OK, but there was a lot of background hiss and so they replaced the microphone control board. Initially the microphone worked OK, but then it started to tun itself off again randomly after a reboot or a suspend/resume. Now that I was convinced that it was unlikely to be a hardware problem so I did a little bit more digging on the Internet. Eventually I found a solution. It seems that although the "sound preferences" application treats the microphone as a single device, there are actually two different devices contained within it. 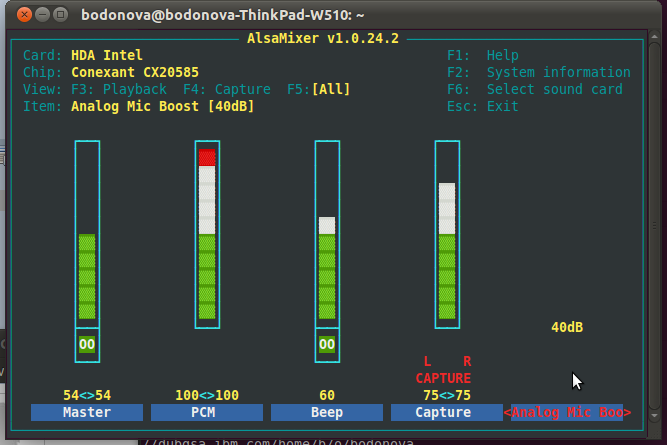 The alsamixer application sees these two devices as "Capture" and "Analog Mic Boost" each with their separate settings (see picture). The sensitivity of the microphone is effectively a combination of both settings, but the "sound preferences" application only adjusts the level of the "capture" device. For some reason the "Analog Mic Boost" had been turned down to 0 and when I adjusted this back up I was then able to make myself heard at team meetings. Thanks a bunch, very helpful! I'm having the same issue. How can I fix it in Windows 7? The fix I mentioned only works for Linux, I don't have much experience of Windows (and in any case I don't have this laptop any more - upgraded to a W540). Windows is a very popular operating system so I expect someone has implemented the same or a similar utility, Maybe a google search would turn up something.